Orders & a holiday sale! We're getting ready for a Friendsgiving pot luck this weekend, complete with apple cider cocktails and all the Thanksgiving favorites. I'm tidying up my studio and shipping out a few orders before all the real house cleaning gets started later this week. I'm so excited for all of these holidays to get here that I've already planned everything I'm making for Friendsgiving and even started a little bit of Christmas shopping. If you like shopping early like me, use the code holidays2013 on any order in my SHOP to get 25% off and free shipping until Dec 20th! Hurray! How cute is this styled shoot for Pregnancy and Newborn Magazine?! Check out lots of other shots of my licensed wallpaper for Hygge & West, and all the other great wallpapers there too, at their blog. It's so fun to see how people use the different wallpapers in their homes and style them for photos! 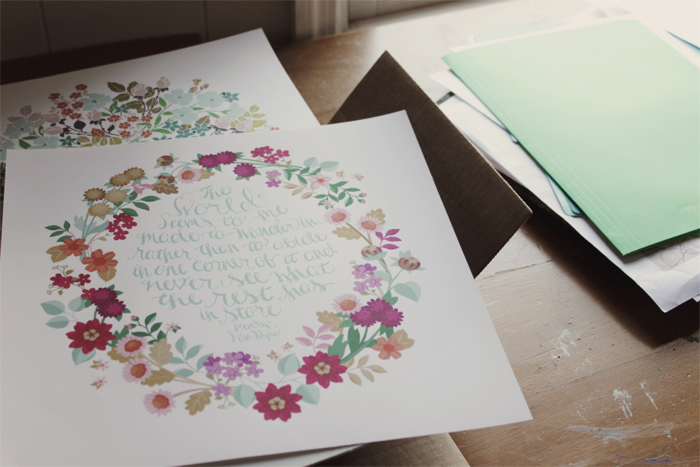 Added to the Wildflower Tangle illustration is a beautiful quote I'd never heard before by Henry Van Dyke, "The world seems to me made to wander in, rather than to abide in one corner of it and never see what the rest has in store." I've had a few people ask me if the original print comes in another color besides black, so I made this version cream. 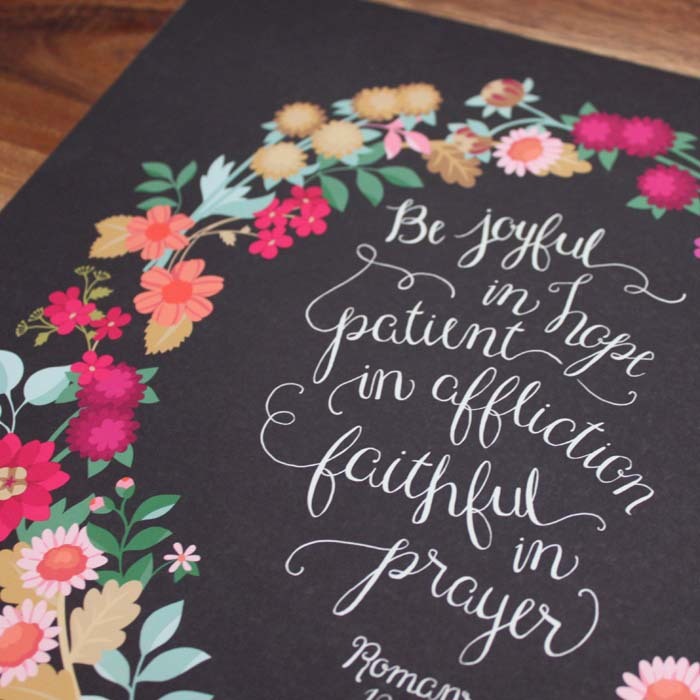 The third new print is of the Romans 12:12 lettering I made a while back. Joseph and I are going to be making some fun things on the intrepid Maker Bot (the 3D printer) this weekend. So far, he's made samples for freelance work, but we've yet to make anything just for fun. Now that I've figured out a few things I'd like to make, I'm impatient to start. Wish us luck! Wow guys, I keep having to reprint items from the Shop. Thanks for your orders! I'm so glad you like the artwork. To celebrate, I'm giving away a print of your choice! Fill out this form below with your name and email address, which will need to be confirmed, and I'll announce the randomly picked winner this Friday, August 16! When I published the new website, I mentioned I'd finally be be able to announce some new licensing product launches, and I am so glad to be able to spill the (some of the) beans. It is so fun to find a company that loves your work and wants to partner with you, and the first of my new licensing partners to announce is Anthology Fabrics! 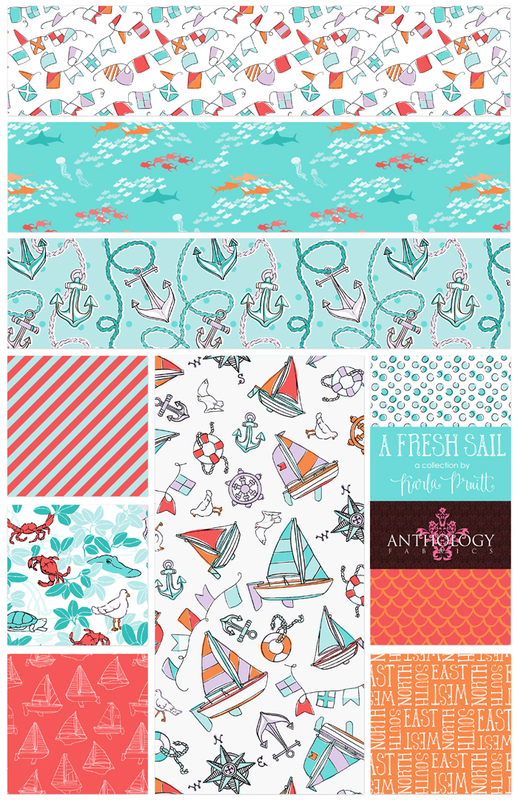 The children's fabric collection is called A Fresh Sail, and let me tell you, this collection has been rolling around in my head for a long time. Want some proof? Yep, that's a me, drawing sailboats, age 8. My mom gave me some of my childhood photos a few years ago, and every one is either me in a boat, coloring, or doing cartwheels. I'm pretty sure my first memory is flipping over and out of a little Sunfish Sailboat with my dad when I was around three. 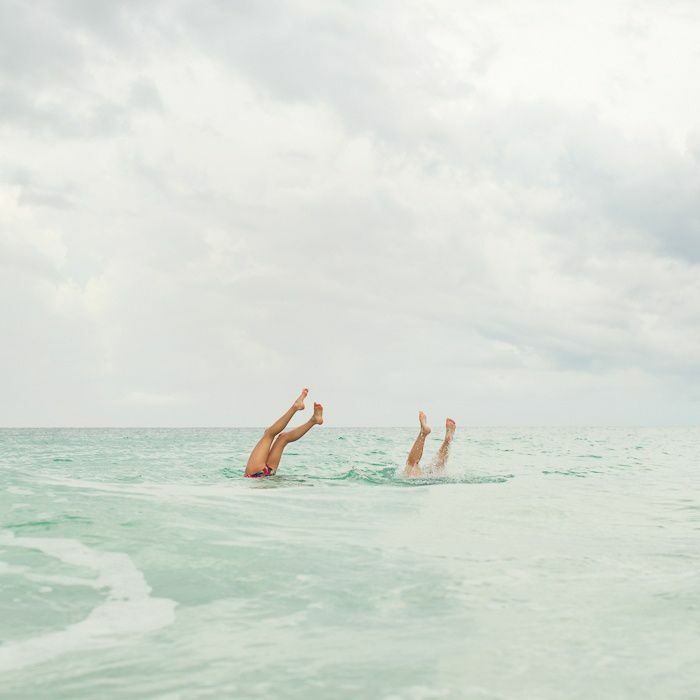 Every weekend was spent out in the ocean, and it was a pretty fantastic way to grow up, even if, as you can see, I've never been a fan of flopping fish. I don't think I've ever taken a fish off a hook, thanks Dad! When I quit my full time design job a year and a half ago, I wanted to design wallpaper and fabric. I feel so fortunate that both of those have happened, and continue to happen! One place A Fresh Sail will be available in October is Hawthorne Threads. Seeing my name listed with so many designers I admire on the Designers page was a little scary at first and humbling too. Anna Maria Horner, Amy Butler, and Heather Ross are super-heros in my book. It's also great to see that my SCAD Fibers friend Sarah Watson's collection is sold there too. It's all been really fun to watch it all come together. Thanks for following along, and I hope you like the new collection! P.S. Apartment Therapy feature?! Wow, ok! A few months ago, I asked a few of my friends with great taste in music to help me pick out some great songs to illustrate for this new print shop I've got going now. They responded with even better recommendations than I expected, and I suspect that in between working on other projects, I'll be returning to my now massive list of illustrative-worthy songs for some inspiration. The first one I've been able to work on is from my friend EB. 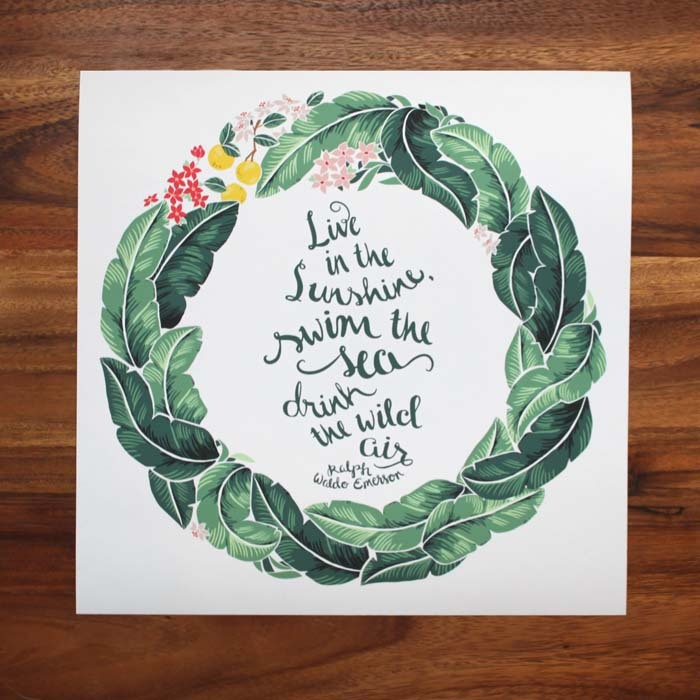 It was such a great suggestion for nursery artwork, and somehow maybe the only Van Morrison song I missed during my obsession in the ninth grade? Here also are some of my friend's who contributed to my gigantic list. I'm so lucky to have such talented compadres. Also, EB, it's not too late to not move to Washington D.C! Just think about it. Thanks to Kristen at the stationary blog Paper Crave ! It's so fun to see the new cards mentioned! A few years ago, I would have never designed this card. I shy away from the color red in every possible way, but working for big design firms (when I was a full time employee and not a licensed artist) forced me to design things I didn't necessarily like. That was a good thing! Not only did I learn and stretch so much as a designer, my aversion to red lessened. Small dashes of bright red are still all I can handle to be honest, but I do like it now, especially when paired with pink and a burgundy. Today I am busily prepping for a photo shoot with my lovely intern Lucy. She has some photography experiance and a fun personality to boot, so I am excited. Thank God I have her to help because I woke up yesterday with a mostly bum arm. I can barely move it in any direction. Yesterday I was sewing the pillow in the photo above, and I kept forgetting that I can't use my left arm at all. I would cry out each time I reached with my hand to pull the turn the fabric to sew a new side on the machine. Ridiculous! I printed the fabric from Spoonflower and made a simple enevelope pillow cover out of it. Here's a photo of the fabric before I cut it. 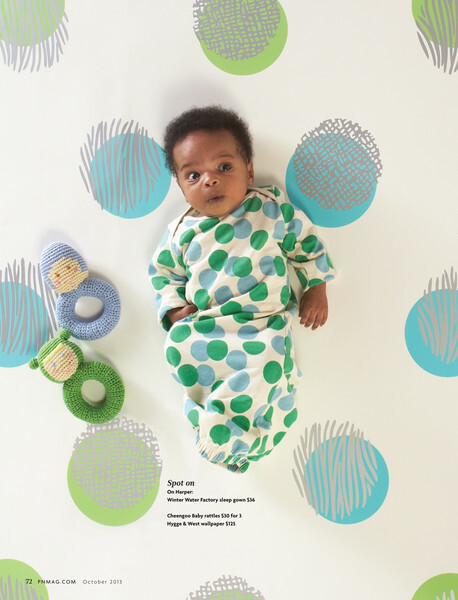 I was thinking, "What would a pattern for a baby anthropologie look like?" I'm sure they will be launching that brand any day now. Actually now that I think about it, I'm kind of surprised they don't have baby stores yet. Well, here's my spin on that anyway. I'll update soon with photo shoot pics! In honor of this most lovely of holidays, here's a sneak peek of something to come. xoxo friends! Now go eat some chocolate.